The first statement I am referring to is the fundraising letter for the Billy Graham Evangelistic Association  (BGEA) that quoted Billy's late wife Ruth as saying, "If God doesn't punish America, He'll have to apologize to Sodom and Gomorrah." The letter goes on, in Billy's alleged words, "My heart aches for America and its deceived people." The earlier statement was a full-page ad for Amendment One  and the North Carolina state constitutional amendment stating the only valid and recognized domestic legal union to be "marriage between one man and one woman." The ad was emblazoned with Mr. Graham's distinguished elderly visage, and appeared in 14 North Carolina newspapers in advance of the May 8 vote that established the amendment as N.C. state law. At the time of the Amendment One ad, official Billy biographer William Martin told the Associated Press  that he believed the words were not those of Billy's son and current BGEA President Franklin Graham: "Franklin has been more outspoken about it, but it sounds as if this is Mr. Graham expressing his own will." When you see an ad such as the pro-Amendment One ad (designed and placed by BGEA representatives), or read a BGEA fundraising letter, or a personal statement issued on official BGEA letterhead, you might question how much Billy Graham has to do with any of these things anymore. I worked for the Billy Graham Evangelistic Association for six years (2000-2006), and I know something of the inner machinations of this multimillion-dollar ministry. Billy Graham is 93 years old, in the advanced stages of Parkinson's disease (among a host of other age-related ailments). He's been having fluid drained from his brain on a regular basis for over a decade. When I worked for BGEA and Mr. Graham was still leading evangelistic crusades around the country, it was well-known that all of his sermons, articles, letters and books were ghostwritten — and had been for quite some time. The tragedy of what's happening right now is that Billy Graham long ago made a personal commitment to avoid picking political sides, especially since being tricked by Richard Nixon in the 1970s in a case that led to a public apology in 2002  after tapes of their private Oval Office conversations were released. Up until this point, the Nixon debacle was arguably Billy's only political misstep, but with each new anti-gay statement put out by BGEA his legacy is being tarnished. What is perhaps saddest about all of this is that I would not object if Billy Graham wanted to make political interventions per se, in the same humility that he developed over decades of getting to know the breadth of Christianity in this country as well as the vibrant diversity of cultural traditions around the world, and the generosity of spirit that is apparent in previous statements he has made late in his life that seemed to imply open-mindedness, a valuing of other perspectives and a willingness to admit he might be wrong. If he were to make these kinds of interventions, I certainly would hope that he might focus on the more obvious and pressing sins of our nation — he could start with two unnecessary wars wrapped in an exploitation of Christian ethics, government-sponsored assassinations, the abuse of the poor, the perpetuation of racial prejudice in politics, the degradation of God's creation by industry, government and citizens alike, and the culture of dehumanization in political discourse — rather than allowing himself to become human product placement for a fast food company. I sincerely fear that Billy has become a puppet for the political persuasions of Franklin Graham (and to a lesser extent, Anne Graham Lotz). I hope people on all sides of this debate will at least stop and question why Billy Graham, elder statesman and "America's Pastor," has been turned into a shill for chicken sandwiches. Images: Billy Graham preaches at the Greater New York Billy Graham Crusade June 25, 2005 in Flushing, New York. Photo by Anthony Correia /Shutterstock. 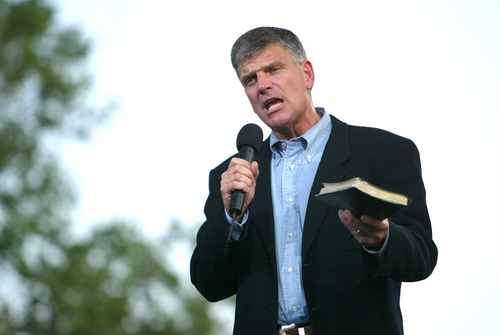 Franklin Graham at the same event in 2005, also by Anthony Correia /Shutterstock.